Photonic metamaterials are artificially engineered optical materials containing nanostructures which give them truly remarkable optical properties. These structures are made from at least two different materials (usually involving both metals and dielectrics). They are normally periodic, with the period being small compared to the optical wavelength. Therefore, the special optical properties do not arise from photonic bandgaps, but rather from an interaction which is more similar to that of atoms or ion in a normal solid medium. In contrast to photonic bandgap materials, photonic metamaterials can be described as homogeneous optical materials, much like natural materials, although with partly rather unusual material parameters. For example, some metamaterials have a negative relative permittivity ε and/or a negative relative permeability μ. Others have a near-zero ε value [18, 20]. Such properties lead to very peculiar wave propagation phenomena, such as negative refraction or propagation with very small phase delays. There is a more general class of electromagnetic metamaterials, operating in different frequency regimes. Many of such metamaterials have been realized for microwaves, where the wavelengths are much longer than in the optical domain, and thus it is easier to fabricate sub-wavelength structures. Photonic metamaterials are generally more difficult to realize, but substantial progress in this area has been achieved particularly since the year 2000. Photonic metamaterials typically contain some kind of metallic nanoscopic electromagnetic resonators, even though it is not always obvious from looking at the shapes of the structures that these act as resonators. An early approach, which has been taken over from previous work in the microwave domain, is based on split-ring resonators (Figure 1). These can be considered as simplified LC circuits, where the inductance has been replaced with a not fully closed metallic ring and the capacitor is formed by the opening in that ring. Such resonators can also have approximately rectangular forms or (if the opening is made larger) like horseshoes. The resonances of such a resonator can be in the mid-infrared domain (with wavelengths of a few microns) when its width is reduced to the order of a few hundred nanometers. Note that multiple resonances with different frequencies may occur, but the lowest-frequency resonance is often most relevant for the application. Figure 1: One layer of a photonic metamaterial, containing metallic nano-resonators on a non-conducting (dielectric) substrate. Light impinging such a structure in a direction perpendicular to the shown plane can excite resonances and experience unusual propagation effects. Such metal–dielectric composites can be fabricated, e.g., with lithographic methods. A frequently used metal is gold. Silver is better suited for high frequencies, but is more difficult to process due to its tendency to be oxidized. Certain experiments are made only with single layers (monolayers) as described above. Three-dimensional structures (3D metamaterials) can be made by stacking such arrays in the vertical direction with a period which is again well below the optical wavelength. When light impinges such nano-resonators, it can excite electromagnetic oscillations. These are particularly strong for frequencies near the resonance frequency, but the most interesting optical effects may occur somewhat above or below the resonance. As the period of the structure is well below half the optical wavelength, there are no photonic bandgap effects, and the effect on light propagation can be described with a (frequency-dependent) effective relative permittivity ε and relative permeability μ of the metamaterial. (The latter can strongly deviate from 1 even if no (ferro)magnetic materials are used.) In addition, one may need a bi-anisotropy parameter ξ, which describes the coupling of electric field strength E and magnetic field density B, or magnetic field strength H and electric displacement field D. Such couplings can occur, e.g., because in a split-ring resonator and electric field can induce a ring current, generating a magnetic field, and a magnetic field can induce a current which leads to the build-up of an electric field. However, ξ can be zero for reasons of symmetry if structures are combined in a suitable way. Still more simplified forms of resonators may consist only of a periodic arrangement of short wires, or of metallic pieces with other shapes. Such forms can be used at shorter wavelengths, now reaching the red end of the visible optical spectrum. There are also metamaterial structures where the whole metallic structure is electrically connected, in contrast to the isolated nano-resonators as described above. Furthermore, there are structures with genuinely three-dimensional building blocks, such as short helically wound wires (helical antennas), which are sensitive to the direction of circular polarization. Such three-dimensional structures can be fabricated, e.g., with direct laser writing in polymer materials, combined with subsequent processing steps for introducing metallic parts. As explained above, the optical properties of metamaterials can be described with the permittivity ε and the permeability μ, and in some cases in addition the bi-anisotropy parameter ξ. Whereas for ordinary optical materials, μ is very close to 1, μ can have totally different values in metamaterials, even though these usually do not contain ferromagnetic materials. All three parameters are generally frequency-dependent and often also dependent on the propagation direction and polarization state of the light. Also, these parameters are not necessarily real (apart from ξ, which is zero at all frequencies for certain structures). The non-negligible optical losses of typical metamaterials (particularly when operating at high frequencies) lead to substantial imaginary parts of ε and μ. For purely real ε and μ, and assuming ξ = 0, the refractive index n is real but can be positive or negative. The sign of the refractive index is chosen such that Snell's law correctly describes the direction of the refracted beam at an optical interface. As the impedance depends on μ / ε, whereas the refractive index depends on μ · ε, two media with the same refractive index do not need to have the same impedance, if μ can vary. (For ordinary optical media, the refractive index determines the impedance and vice versa, as μ is very close to 1.) Similarly, two media can have the same impedance while differing in the refractive index. This is relevant, e.g., for the magnitude of reflections from optical interfaces, which depends on the different impedances. For example, there would be no reflection at the interface between vacuum and a medium with μ = ε = −1, although the refractive index changes from +1 to −1: the impedance is the same on both sides of the interface. The following subsections discuss photonic metamaterials with optical properties which are of particular interest. If both ε and μ are negative (→ double-negative metamaterial) and ξ is zero, one can show that the phenomenon of negative refraction occurs at interfaces between vacuum and the metamaterial. (For a bi-anisotropic material with ξ ≠ 0, negative refraction can also occur .) As illustrated in Figure 2, the refracted beam is not on the usual side. This can be described with a negative refractive index, changing the sign of the angle in Snell's law. Figure 2: When a beam coming from vacuum hits a negative-index material (right side), the refractive beam inside the medium is on the same side of the surface normal as the incident beam. This is in striking contrast to the situation for “ordinary” positive-index materials (left side). The reflected beams have been omitted in the drawing. Negative refraction has a number of consequences, leading to additional very unusual optical properties. In particular, the wavefronts of the refracted beam travel toward the interface, i.e., in a direction opposite that of the energy flow (as indicated by the Poynting vector). The direction of the Poynting vector is still given by E × H, but as B is now in the direction opposite to H, the Poynting vector is opposite to the direction of E × B. For that reason, such media are also called left-handed metamaterials (LHM): a left-hand rule instead of the usual right-hand rule delivers the direction of the Poynting vector from E and B. The term “left-handed” is somewhat unfortunate as it may suggest a (non-existing) relation to the phenomenon of chirality, as discussed below. A convex lens made of a negative-index material could be defocusing rather than focusing, and a concave lens could be focusing. 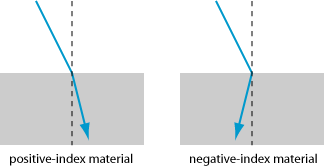 Even a simple plate (with planar and parallel end faces) of a negative-index medium could act as a lens. If the refractive index is −1, this could even lead to a superlens (perfect lens), creating images of objects with a resolution not limited by diffraction. It has been shown, however, that this property would be achieved only if the refractive index is extremely close to −1  – so close in fact that such an application appears utterly unrealistic. Still, superlenses based on a modified scheme are possible [3, 6], where however the distance from the object to the lens must be extremely small, and the effect is thus less intriguing. Note also that there are superlenses based on effects other than negative refraction. Very peculiar effects would occur if some object could be embedded in a negative-index metamaterial. Depending on its depth in the medium, it may appear strongly magnified and distorted for an observer outside the material. It should even be possible to make cloaking devices (invisibility cloaks), which can hide objects within them against viewing with light from outside, although probably only in a very limited frequency range. As mentioned above, there are also metamaterials containing metallic helical nanowires. These have a certain handedness, which can lead to substantially different optical effects for light with different directions of the circular polarization. It is possible to obtain metamaterials which are highly absorbing for one circular polarization direction and have a high transmission for the other polarization direction. The resulting device can be called a circular polarizer. A negative refractive index is not required for that phenomenon. A first difficulty with metamaterials for operation at short wavelengths, e.g., in the visible spectral region, is the fabrication of very fine structures such that their period is still well below the optical wavelength (within the medium, not just in vacuum). Some lithographic techniques are just sufficient to fulfill that condition, partly by using shorter wavelengths for the fabrication and partly by achieving a sub-wavelength resolution. Other techniques such as direct laser writing can also be employed. The speed of such fabrication methods may limit the size of the parts made within a reasonable time. More fundamental limitations arise from the properties of the materials used. In particular, there are no perfect conductors for frequencies of hundreds of terahertz. Therefore, particularly devices for the highest frequencies exhibit relatively high optical losses.